This doesn’t bode well in America where the Centers for Disease Control and Prevention reports more than two thirds of all adults are either obese or over weight. It appears the mantra for American culture with regard to food is: “We live to eat” rather than eat to live. Yet, ironically, the former can apply to hefty and foodie alike, often putting both on the wrong side of the scale. Whether one craves “all you can eat” and “supersize me,” at home or away, or small plates, organic and sustainable, it’s still a matter of quantity as well as quality. One’s “profile” may still be the same. We truly are the choices we make. Our cultural values do reflect the human condition. Not unusual that such food for thought be the concern of nutritionists and the medical field alike. But it is a surprise when an art center incorporates food awareness and community engagement into its creative vision as well as a thematic residency. Such is the current initiative at the Bemis Center for Contemporary Arts put into place by former Executive Director Adam Price and Program Director Amanda Crowley. One such artist who has benefitted from this food-themed residency is Shilpa Rangnekar, who lives and works in Jaipur, India. Rangnekar has successfully transitioned her Culture Kitchen Archive project into her first solo exhibition, which just closed at the Garden of the Zodiac gallery in the Old Market. CKA is her ongoing, creative effort to know and explore a place through its food culture in partnership with the communities of the region. It also was meant to inquire into the relationship between home and food. “Food is one of the means to our perception of identity,” Rangnekar says. “The way we eat, and what we eat not just differentiates us with others but also, at the same time reflects aspects of a home, community, culture and geography connected with it. Aptly titled Identify It. Share It. Eat It. Live It., the exhibit consisted of three food installations that encouraged viewers to partake in her offerings as a sort of ritual of communion and identification. The titular first installation featured a word search puzzle made of Mathri, deep-fried crackers in the shapes of letters that formed human qualities, such as empathy, courage, joy and hope, which the artist encouraged viewers to “solve, share and eat” with others. 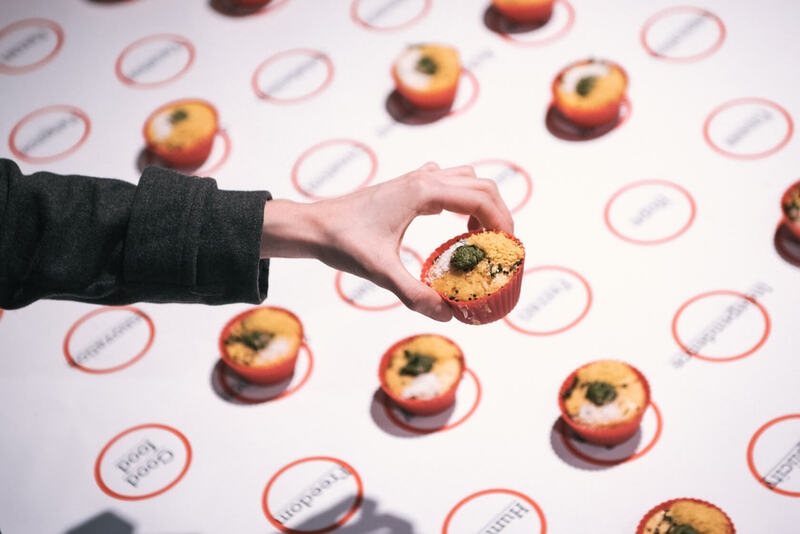 The second, “Desire Food Cupcakes,” were made from an Indian recipe, Khaman, which were steamed and savory rather than sweet, and adorned with coconut and green chutney to add texture. Each one hid a human desire that was only revealed when you picked a cupcake up, thus possessing more of a risk as with a fortune cookie. Greater risk but doubly rewarded by sharing this unknown bond of taste and desire with another culture. It’s worth noting that Rangnekar collected all 60 of the said desires from visitors during her Open Studio at Bemis last month and they were generous with such choices as: peace, stability, a big house, vacation, patience and…good food. The last installation, which was actually the first one encountered in the main gallery, this writer found to be the most complex and interesting. Called “Eat Your Choice,” it was composed of Modaks, fried dumplings made of flour and stuffed with coconut, jiggery and cardamom, each with a label illustrating one of 555 personality traits listed by noted psychologist Norman Anderson. Anderson organized his list in a descending order of likeability it and ran the gamut from sincere and honest to realistic and amiable, from cautious and shrewd to compulsive and demanding, ending with the least positive, phony and liar. It was his attempt to gauge real human values as opposed to more superficial, pop cultural ones like wealth, social status and physical beauty. Regardless of which installation, it’s important to understand that though the artist recognizes that we are what we eat…and choose, in no way is she being judgmental about one’s preference or personal taste. At the most, her performance and audience participation show is humanitarian and accepting, qualities she believes all cultures share in common and communion. “I incorporated both positive and negative personality traits (in each installation),” Rangnekar said. “I feel making a choice of quality is a very personal gesture. Sometimes you want to be selfish, but in the show, the viewers were thrown in a situation where they have to make a choice in front of others, and also consume. Apparently, yes, as the audience seldom hesitated to experience something new, while taking ownership of their indulgence, without much forethought or conscience. “Modaks” flew off the shelf regardless of their “likeability,” that is, whatever label of personality that identified it. It didn’t seem to matter as long as one’s curiosity and appetite were satisfied. Two interesting observations about the exhibition’s aesthetic that seem to reinforce the above when it comes to the human condition and food. One, regardless of installation, no matter how or what one chose to eat, and what quality it may have represented, positively or negatively, the ingredients and recipe for each cracker, cupcake and dumpling were the same, so was the palette. Of course, one’s palate response will be different, individual taste being what it is, but then that may also reinforce how differently we respond to the human personality traits and characteristics that accompany the above food choices, as well. In a politically charged environment, one presidential candidate’s brusqueness and bravado may appear to be a strength. Another’s caution and thoughtfulness a weakness. You could sit down and have the same beer with each, but will it taste the same? We truly are what we eat, and drink, and with whom. A second factor that may have influenced even our willingness to participate and indulge opening night was presentation. Items for the three “taste tests” were pleasingly and carefully displayed referencing respectively, a bakery (cupcakes), game room (crackers) or most effectively, museum display shelves (dumplings). The urge to sample and hold, let alone taste, was difficult to suppress. Regardless of the outcome, we all initially responded in kind and Rangnekar couldn’t be happier with her first cultural solo outside the box. “To me, my works provide a situation for people where they can see and share the commonness amidst others (known and unknown) from different cultures and geographies.